Hat Size, Large. Gold embroidered on black wool backing. Usually a gold wreath with the insignia inside. Shown are- USSS (Sharpshooters), Topographical Engineers, GAR, US Staff, MS, Engineers Castle, USM (Marines), US in Shield, US General (Stars), Engineers Castle (Variation), Cavalry with USS, US General (Star). Not shown designs include- CSA, Chaplain, Signal Corps, etc. Variations occur, and these are documented, as in the Engineer which has a different type branch on each side. This can be found in the Naval hat insignia as well. Kepi Size Badges, Small size approx 2" - 2 1/2". Gold embroidered on black wool backing. Usually a gold wreath with the insignia inside. Shown are Infantry, US, MS, Ord Bomb lg, Ord Bomb Sm, Artillery, Cavalry, CSA, as above. Badges above are examples. We can make any design needed. Please note-these custom badges can take some time to have made. Patience is a virtue, but the result is usually outstanding. For those that do not pay attention.... these are not in stock, we have them custom made for you. If you need a special design please contact us. Special Embroidered Badges- We have made two different "off period" items due to demand. The Bagpipes and Drum are both embroidered with metallic thread on green wool backing. 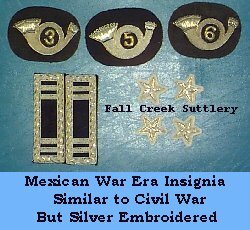 Mexican War Period Hat Badges. Larger Bugle than Civil War Style. Badge Approx 3 1/2". Silver bugle with gold regimental number. Specify regiment below. We can make the other branches if desired. please send in your design. Signal Corps Insignia . Crossed Signal Flags on a black wool background for the Hat Badges, Crossed Signal Flags in the center of a dark blue background for Shoulder Boards. Hat Badges are large size. Shoulder Boards can be any rank- 1st or 2nd LT, Capt, Major or Lt Colonel. Shoulder Patches are crossed flags as shown on a Dark Blue patch to affix to the Coat sleeve, or trim out to affix with no backing. Please contact us to see what we have in stock- these may need to be custom ordered. We Can Custom Make Insignia With Your Reg't Number. We can also custom make any insignia not currently available. Please send us your diagrams for a quote. Gold bullion thread on a velvet field like the original examples. Background; Infantry- Med Blue, Cavalry-Yellow, Artillery-Red, Staff and MS- Dk Blue. Generals of all branches were Staff only, so Dark Blue is the only appropriate backing for this rank. "Extra Rich" style has a wider gold border and rank stripes, with extra gold embroidered in. We stock a full compliment of ranks and branches of service. We can custom make double and triple row borders or any other shoulder board you need. As Above, but for Generals. One star- Brigadier General, Two Stars- Major General, Three Stars- Lieutenant General. Extra Rich style as above. Single Row Gold Border. Can be used for US or CS. Generals of all branches were Staff only, so Dark Blue is the only appropriate backing for this rank. Special Shoulder Boards, Normal size, Extra Rich sgl border. Dk blue backing for staff with the design and rank of your choice. Shown are- Topo Engineer Capt (Old English TE), Signal Corps Capt, Paymaster Dept Capt, Paymaster Dept Lt Col, Engineer Capt, Engineer 2nd Lt, Topo Engineer (TE) 1st Lt.
Note- Special made shoulder boards are not returnable. Extra Row Shoulder Boards. Special Shoulder Boards with Two, Three, Four rows or Oak Leaf Border. Made as above with gold metallic thread on a velvet backing per the originals. These boards are larger than the standard shoulder boards. Can be approx 2 1/4" X 4" depending on the number of rows. Your choice of border, rank and background color. Not limited to the examples shown. We usually have some of these in stock, but they are usually custom ordered. Shown are- US Brigadier General with Oak Leaf Border, US Lieutenant General with Oak Leaf Border, US lt Colonel with three borders (Extra Rich), US Artillery Colonel with four plain rows, US Major (Mexican War) with Oak Leaf Border, US Staff 1st Lieutenant with double borders, US 2nd Lieutenant with triple rows (Extra Rich). These custom shoulder boards can take some time to have made. Patience is a virtue, but the result is usually outstanding. If you need a different color, please contact us. CS Collar insignia: All branches, all ranks. Gold embroidered bar on wool backing. Infantry- Blue, Artillery- Red, Cavalry- Yellow, Staff- Black, General Staff- Buff. Five pointed stars approx 1". Gold star on background to match your branch of service. Ranks are- Major- one star each side, Lt Col- two stars, Colonel- three stars each side of collar, $8.00 per pair. Accessories for the Officers' Chabrock (spelling?) or saddle blanket. Gilt embroidery with sequins sewn onto a black felt back ground. Set includes the eagle facing right and left, one for each side of the blanket. This eagle can also be seen in a photograph of General Rufus Ingall, Cheif Quartermaster of the Army of the Potomac on pg 301- The Photographic History of the Civil War- The Cavalry. The Officers Horse Blanket also utilized the six pointed stars as listed above. Masonic Embroidered Canteen Cover. Masonic Square and Compass embroidered onto 100% wool. Select from Light Blue or Dark Blue background. Approximately 12" square, large enough to cover one side of your canteen.